The Creation (German: Die Schöpfung) is an oratorio written between 1797 and 1798 by Joseph Haydn (Hob. XXI:2), and considered by many to be one of his masterpieces. The oratorio depicts and celebrates the creation of the world as described in the Book of Genesis. The libretto was written by Gottfried van Swieten. The work is structured in three parts and scored for soprano, tenor and bass soloists, chorus and a symphonic orchestra. In parts I and II, depicting the creation, the soloists represent the archangels Raphael (bass), Uriel (tenor) and Gabriel (soprano). In part III, the bass and soprano represent Adam and Eve. The old Covent Garden theatre, site of the English premiere in 1800. Engraving from 1808. The first performances in 1798 were mounted by the Gesellschaft der Associierten, a group of music-loving noblemen organized by van Swieten to sponsor concerts of serious music; the Gesellschaft paid the composer handsomely for the right to stage the premiere (Salomon briefly threatened to sue, on grounds that the English libretto had been translated illegally). The performance was delayed until late April—the parts were not finished until Good Friday—but the completed work was rehearsed before a full audience on April 29. The first performance the next day was a private affair, but hundreds of people crowded into the street around the old Schwarzenberg Palace at the New Market to hear this eagerly anticipated work. Admission was by invitation only. Those invited included wealthy patrons of the arts, high government officials, prominent composers and musicians, and a sprinkling of the nobility of several countries; the common folk, who would have to wait for later occasions to hear the new work, so crowded the streets near the palace that some 30 special police were needed to keep order. Many of those lucky enough to be inside wrote glowing accounts of the piece. In a letter to the Neue teutsche Merkur, one audience member wrote, "Already three days have passed since that happy evening, and it still sounds in my ears and heart, and my breast is constricted by many emotions even thinking of it." 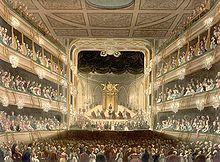 The first public performance at Vienna’s old Burgtheater at the Michaelerplatz on 19 March 1799 was sold out far in advance, and Die Schöpfung was performed nearly forty more times in the city during Haydn’s life. The work became a favourite of the Tonkünstlersocietät, a charitable organization for the support of widows and orphans of musicians, for which Haydn frequently conducted the work, often with very large ensembles, throughout the remainder of his career. The Creation had its London premiere in 1800, using its English text, at Covent Garden. The 1808 performance of "The Creation" in honour of Haydn; reproduction of a stationery box lid painted in watercolours by Balthazar Wigand. Click to enlarge. The Creation was also performed more than forty times outside Vienna during his life: elsewhere in Austria and Germany, throughout England, and in Switzerland, Italy, Sweden, Spain, Russia and the United States. Despite the eclipse in Haydn's reputation as a composer in the 19th and early 20th centuries, the work never left the repertoire during this time, and today it is frequently performed by both professional and amateur ensembles. There are many recordings (see below). The oratorio is scored for three vocal soloists (soprano, tenor, and bass; there is also an incidental solo for alto in the finale), four-part chorus (soprano, alto, tenor, bass), and a large Classical orchestra consisting of 3 flutes, 2 oboes, 2 clarinets, 2 bassoons, contrabassoon, 2 horns, 2 trumpets, alto, tenor, and bass trombones, timpani, and the usual string section. For the secco recitatives a harpsichord or fortepiano is also used. Aria for soprano in F major, celebrating the creation of birds. The species mentioned are the eagle, the lark, the dove and the nightingale. The lyrics include the conceit that, at the time just after the Creation, the nightingale's song was not yet melancholy. ^ suddenly forte in C major on "light"
^ a b c d e f Wigmore, Richard (10 January 2009). "Franz Joseph Haydn (1732–1809) / The Creation (Die Schöpfung), HobXXI/2 (1796–8)" (PDF). Barbican Centre. p. 3. Archived from the original (PDF) on 21 January 2012. Retrieved 29 September 2011. ^ Temperley, Nicholas (1991). Haydn: The Creation. Cambridge: Cambridge University Press. p. 26. ^ See Bryan Proksch (2015) Reviving Haydn: New Appreciations in the Twentieth Century. Boydell and Brewer. ^ Haydn, Joseph (2001). The Creation in Full Score. Dover. ISBN 0-486-41907-X. ^ See Rosen (1997:372), who offers detailed commentary on this movement. ^ See, for instance, Richard Wigmore's remarks in program notes: "Archived copy" (PDF). Archived from the original (PDF) on 2016-03-04. Retrieved 2016-06-15. CS1 maint: Archived copy as title (link). ^ Burnside, Iain. "Building a Library: Haydn: The Creation". CD Review – Building a Library. BBC Radio 3. Retrieved 29 December 2013.